Nowhere else on Earth can you train to go to Mars and experience astronaut training than at Kennedy Space Center Visitor Complex. Join the crew as you launch a mission simulation including launching, landing and walking on Mars, and experience microgravity. 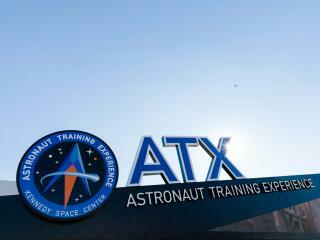 In the all new Astronaut Training Experience® (ATX) at Kennedy Space Center Visitor Complex, train like the next generation of space explorers who will travel to Mars and be transported to the red planet to live and work for the day. During ATX, hone your docking skills, navigate the Mars terrain and experience the sensation of conducting a spacewalk in a microgravity environment. Participants perform two spacecraft launch mission simulations using the full-scale Orion-style capsule and authentic Mission Control Centre. Mars Base 1 invites Rookie Astronauts to manage operations, harvest vegetables in the botany lab, and work through challenges of thriving in the harsh environment. It is an experience like no other on the planet. Teamwork, communication, and collaboration skills are developed as participants take turns in the Training Control Centre, guiding one another through a series of challenges. After the program, they receive an electronic report detailing their achievements along with a video log they recorded during the day. Operates: The ATX programme runs at various dates throughout the year on Wednesdays, Saturdays and Sunday. Schedule: The programme starts at 8.30am or 4.30pm on the dates available. Location: Check-in at the new ATX Facility to the right hand side of the general entry gate at Kennedy Space Center Visitor Complex. Advance reservations are required. You must select your chosen date at the time of booking. ATX participants must be 10 years of age or older. Participants aged 10 - 17 years old must be accompanied by an adult. Some height and weight restrictions apply on certain simulators. Shorts or trousers are recommended (no skirts). Athletic footwear preferred. Expectant mothers and those with abnormal blood pressure, adverse heart conditions, ear or sinus infections should not participate in certain activities. Transportation to Kennedy Space Center Visitors complex is not included. Your ticket does not include entrance to the exhibits at Kennedy Space Center Visitor Complex – a separate Kennedy Space Center Admission Badge or a Space Pass must be purchased should you wish to explore these areas. Tour may be altered or closed due to operational requirements - i.e. during shuttle launches - in this instance an alternative date will be offered or you can receive a full refund.